A long time ago, I used to be the kind of person that would make zines on a Thursday night (instead of drink Negronis and watch Adventure Time and look for ways to make cheap cuts of meat resplendent, herbal, and delectable… ah aging). I made zines about myself, mostly, with all the semi-decent poetry, navel gazing and room-wide collage operations THAT involved, and I would direct you to the place to buy them but I cancelled my Etsy account. C’est la vie, n’est pas? Hee hee french. 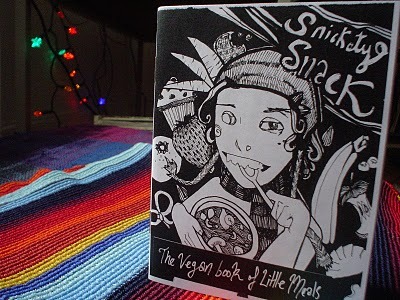 Anyway… my most popular creation, and for good reason, was the 100% angst free collectione of absolutely original vegan recipes I managed to get myself to write down over the years – Snickety Snack, in dancing monocolour. It comes with a picture of a cat-girl playing a harp, and a curried apricot & almond dressing, and some lavender brownies and my sister’s Guaranteed-T0-Make-You-Fail-A-Drug-Test poppyseed loaded quinoa salad of magical proportions. 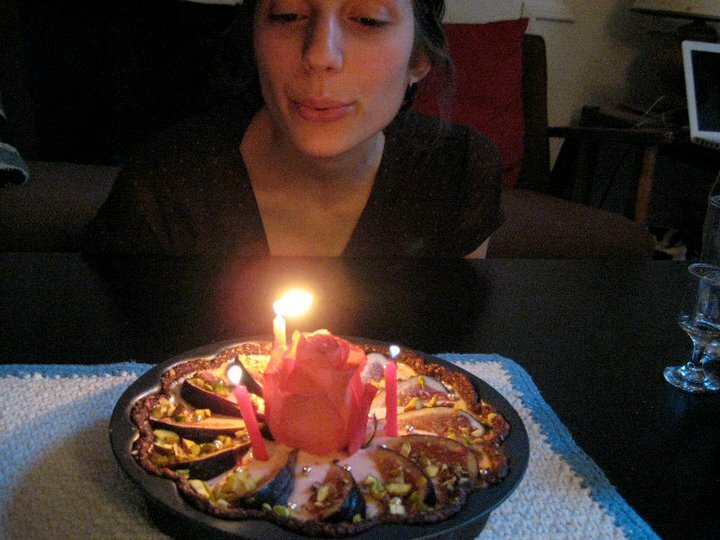 Also, my favourite original recipe ever: my raw rosewater cheesecake. I have quit the Etsy business and have no interest in incremental zine sales, as marginally lucrative as that is. And so, with fond adieu, I am GIVING AWAY the last 7 copies of my zine to the first 7 commenters on this post. Just send your mailing address to elzranger@gmail.com and I’ll hook you up with the goodstuff. I might even be inspired to make a new, fully omnivorous cookzine of my favourite dessert creations. You heard it here first, lovely peeps. 2. Process the dates until they form a smooth paste, then add that to the nut mixture with the rest of the crust ingredients and knead until it forms a malleable dough. Press that into a springform cheesecake pan or pie plate and freeze while you make the cream. 3. Drain the cashews, then add all of the rest of the cream ingredients in a blender and blend until thick and very, very smooth. Pour over the chilled crust and freeze for at least 5-6 hours. 4. Decorate beautifully and serve cold. I remember that cake! Awesome! dude! ham pie sandwiches! and I remember *you*. Yep, 1 zine coming right up! i would love one! emailing you now. also, rosewater is one of my favorites and since cane sugar is making me feel so badly these days, i can’t wait to make this. Thank you so much for the zine! I remember your old blog, what a surprise! Would you like a copy of my Ethiopian zine? could you pretty please email me your addy to kittee68 at gmail dot com. i’m going to the PO wed! Looks gorgeous! How does it smell? Like rose? I would love a vegan recipe zine for other creative recipes. excellent, send your mailing addy to underwatercigarettes@gmail.com and I’ll have one in the mail for you, post-haste. it says 1/4 rose essence. but 1/4 a what? teaspoon? tablespoon? cup? Would love to make this – can you clarify how big a cup is? That would be a standard imperial measure – 1 cup is 250 ml of water, 130 grams of flour, 2 sticks of butter, etc. The weight will change based on the ingredients, but the cup “measure” is the same, and easily found in a 99 cent store or something like that.